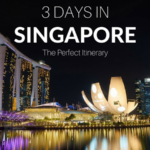 We flew Singapore Airlines again on our way to Singapore but this time in business class. The business class cabin consisted of recliner seats in a 2-2-2 configuration. Seats were comfortable but they did not have under seat storage. Blankets and pillows were available for use. Surprisingly, slippers were not. We didn’t particularly care but it was the first Asian airline we’ve flown on that didn’t offer them. Then again, it was a short flight. The service was great. Bonus points to the flight attendant who brought us a Vogue magazine to read. The food was pretty good. The flight attendant noticed we liked the garlic bread so he snuck a few more on our plate. Here are some photos of the menu (click to enlarge) and what we ordered. Overall, this was an enjoyable short flight in Singapore Airlines business class. Food and service were good and we had no complaints.